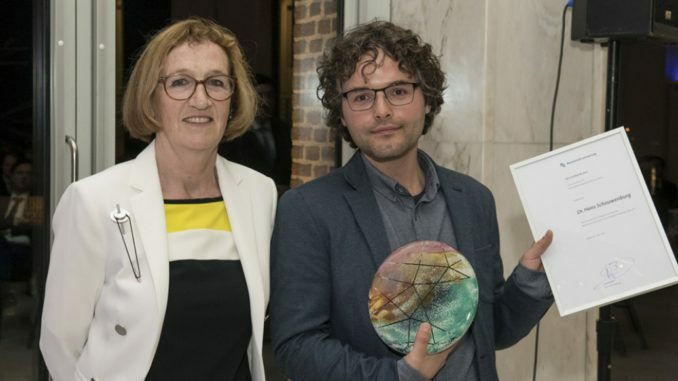 Former MUSTS member Hans Schouwenburg was among the two winners the of the UM Valorisation Prize 2017, for the quality of their valorisation chapter in their dissertation, which is a required chapter in all dissertations defended at Maastricht University. In total the faculty deans nominated ten candidates from the eligible pool of 343 candidates who earned their PhD at the UM. The jury established that the quality of the nominations increases each year. The jury unanimously decided to award two valorisation prizes this year. Hans Schouwenburg wrote the dissertation ‘Strategies to Save the Earth: Nature Conservation Experts and Sustainable Development, 1980-2000’ at the Faculty of Arts and Social Sciences, within the MUSTS research programme, under the supervision of MUSTS members Ernst Homburg and Raf de Bont. Politicians, businesses and citizens, everyone finds sustainability important. But what is it exactly? This dissertation studies the history of the concept of sustainability, the experts who shaped the idea, and the interests that played a role behind the scenes. It shows that sustainability has been redefined over and over again throughout the years. Because of all those differences and often contradictory opinions the concept is vague, sometimes attracts hypocrisy, and in practice often leads to disagreements. At the same time, sustainability, because it is so vague, enables the formation of broad coalitions in the international debate about environmental problems and development cooperation. Exactly there lies the power of the notion. Currently, Hans Schouwenburg is preparing a popular publication on sustainability derived from his PhD thesis. He now aims to garner the attention generated by his work through a continued study of the relationship between sustainability and agriculture, in particular the changing dynamics between conservationists and farmers over time. The jury hails Hans Schouwenburg as a shining example of the social significance inherent in the humanities.